In the nutraceutical or pharmaceutical industries, manufacturers are required to quarantine ingredients and containers before for testing before they can be introduced into new products. Not only does this help limit contamination, but it also ensures consistent quality is achieved among the ingredients used. To help achieve this efficiently, the Quarantine Inventory window allows you to quickly create batches of new ingredients that may be being received by your facilities. 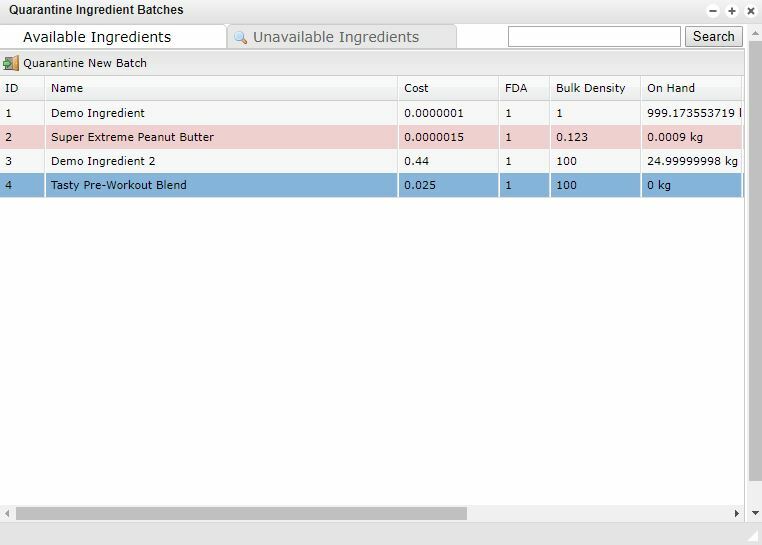 The Quarantine Inventory window for Ingredients provides a list of all Available or Unavailable Ingredients depending on the current tab you have open. Like many of the other windows available in Virtual Office, the fields can be sorted by ID, Name, Cost, Amount on Hand, Amount on Hold and any more options. Once you have found the ingredient you want to quarantine, select it then click Quarantine New Batch at the top of the window to open the Quarantine New Batch screen.